This IS the Big Daddy!! So few can conquer it! 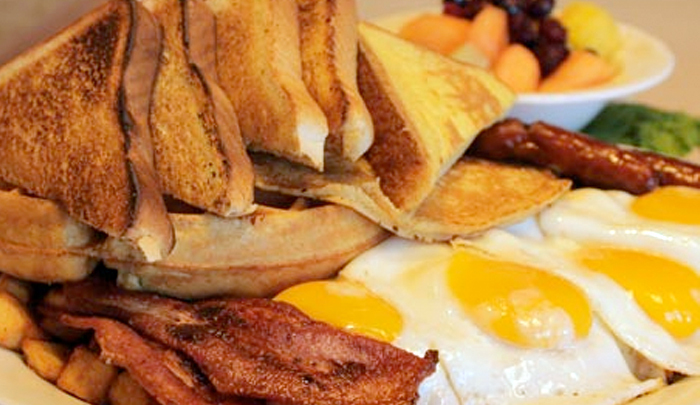 COMES WITH ALL THIS… Four eggs any way you like them, a mess of hash-browns, one waffle, one pancake, one french toast, two bacon, two sausage, a bowl of fruit and choice of toast… hope you’re hungry!!! It weighs four pounds without the plate…honest!! Wanna share? Go ahead. Mike’s Mountain – Click on image to enlarge. 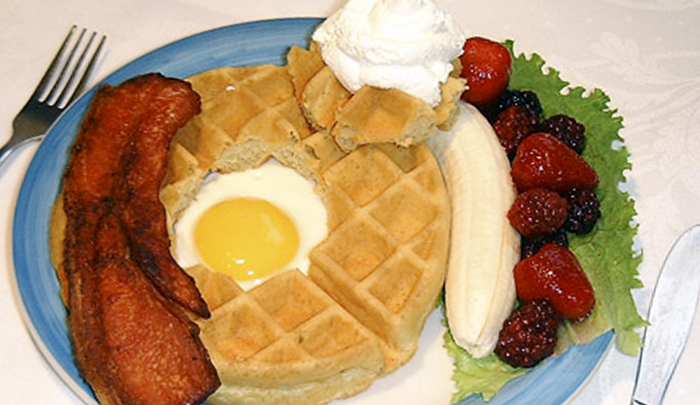 One waffle, one sunny side egg, fruit and a strip of our own thick cut bacon. Hole-in-one – Click on image to enlarge. Two 10 inch crepes filled with our own recipe of Cranberries and Cream cheese. Drizzled with raspberry coulis and whip cream. 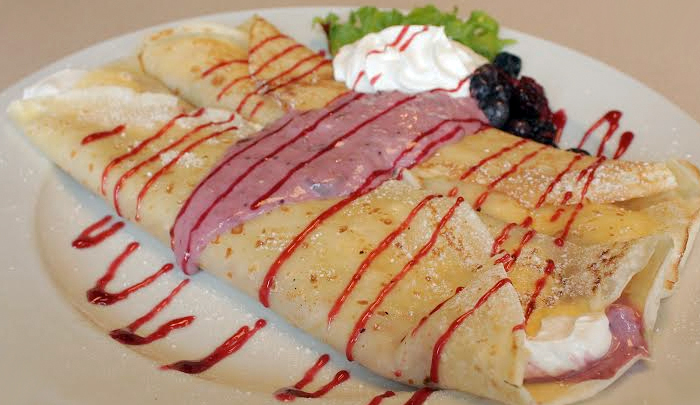 Cranberry Crepes – Click on image to enlarge. Mr. Mouse pancake, a strip of bacon and hash-brown potatoes. Snicker Doodle – Click on image to enlarge. 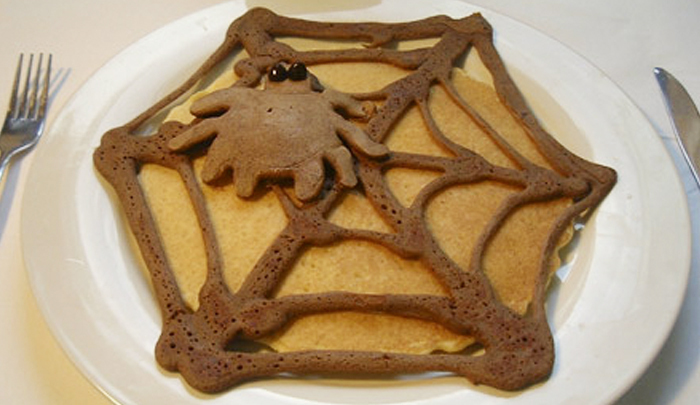 Griddle cooked pancake spider and spider web. You gotta see this! Spider Cake – Click on image to enlarge. Our version of quiche. 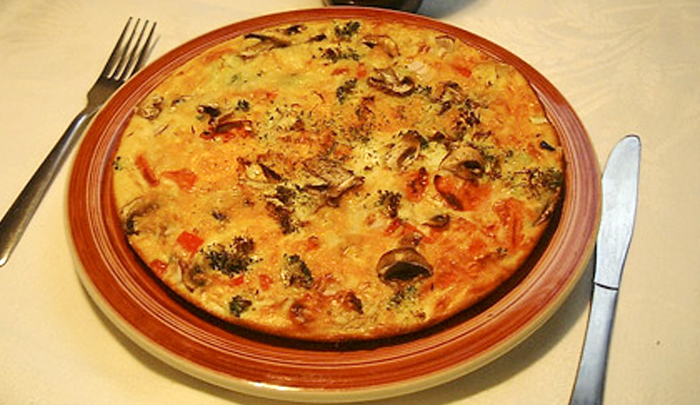 Filled with fresh broccoli, onions, peppers, mushrooms, tomatoes and topped with Swiss and cheddar cheese. Barb’s Garden – Click on image to enlarge. 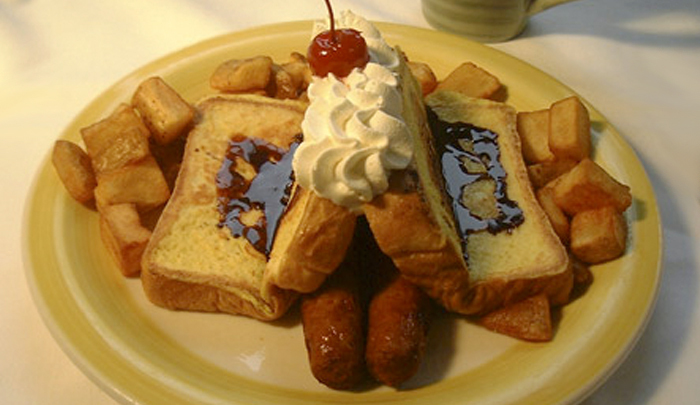 Two pieces of French toast that form a dog house. Chocolate sauce for roofing and two sausages inside…his legs. 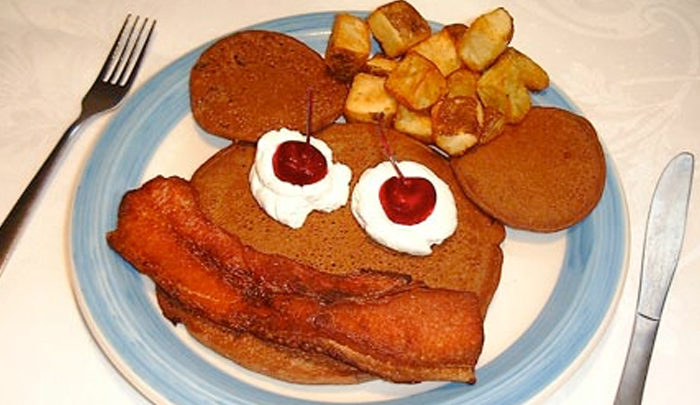 A hash-brown fence surrounds the dog house topped with whip cream and a cherry. The Dog House – Click on image to enlarge. Wow…This French toast is first griddle cooked until golden brown, then deep fried until CRISPY CRISPY. Calories don’t count when eating at Dean Michael’s!! 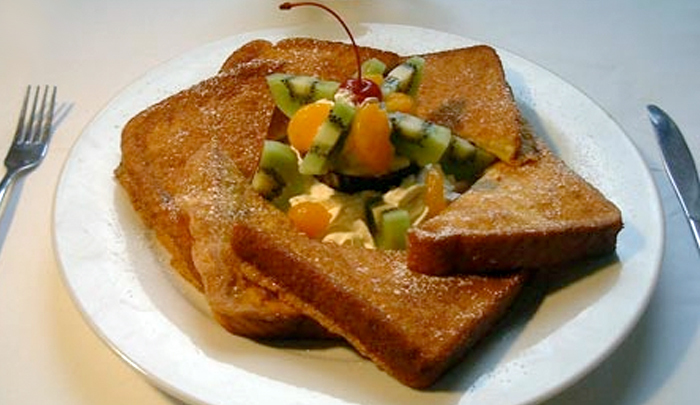 Deep Fried French Toast – Click on image to enlarge. Two sausages wrapped in honey glazed bacon, sitting on top of griddle cooked mushrooms and rye toast, two poached eggs and garnished with tomato. 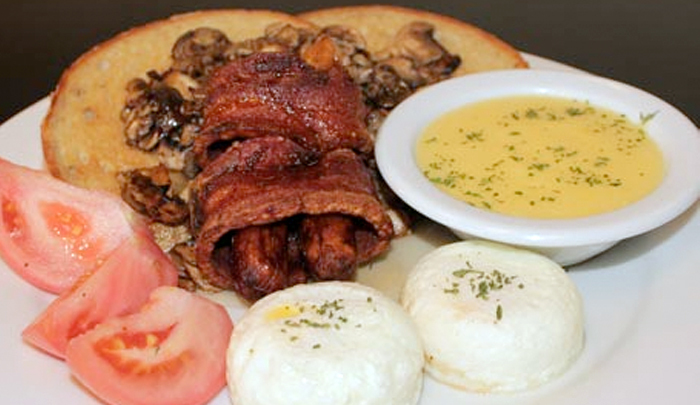 Comes with hollandaise. Sausage & Shrooms – Click on image to enlarge. A 10 inch overstuffed grilled Panini crepe with out own bacon bits, diced tomato and warm cheddar cheese. 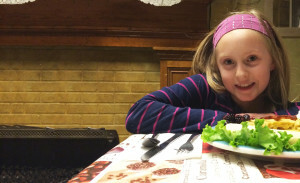 Comes with sour cream and your choice of garden salad topped with a hard boiled egg or Caesar salad. 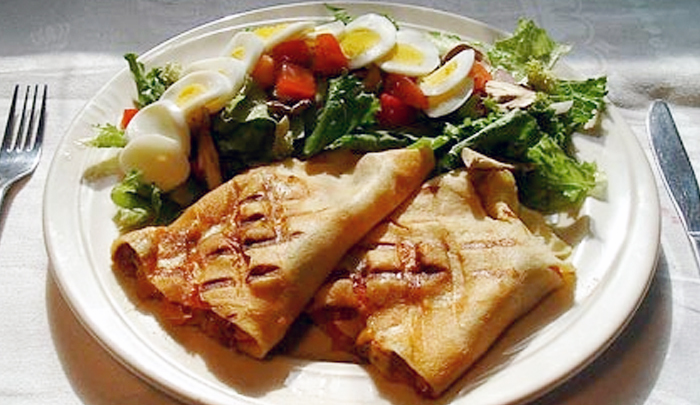 Grilled Bacon & Tomato Panini Crepe – Click on image to enlarge. 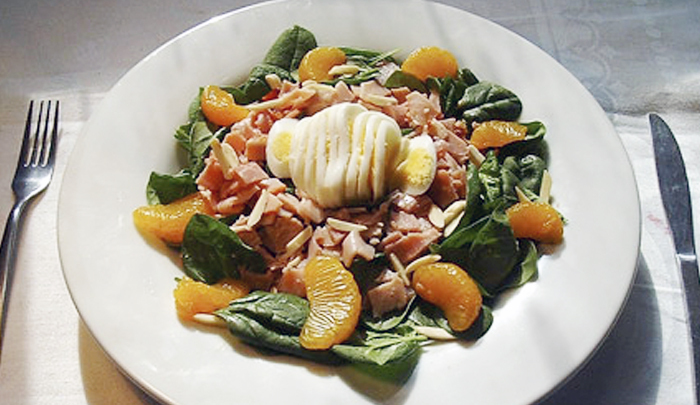 A large salad of spinach topped with mandarin oranges, slivered almonds, a hard boiled egg and ham. A very hearty salad. Spinach Salad – Click on image to enlarge. Topped with mixed fruit… banana, kiwi, orange, pineapple, mixed melon, grape and berries. 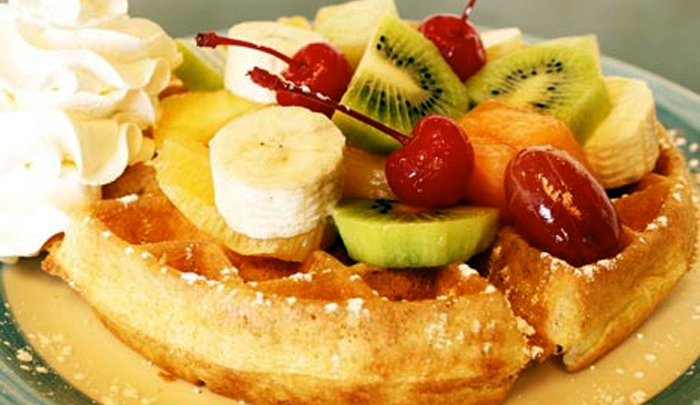 Fruit Medley – Click on image to enlarge. 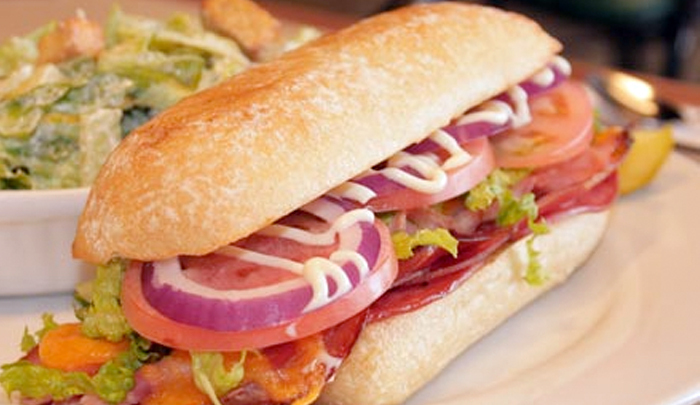 This deli inspired sandwich is oven toasted with layers of prosciutto, ham and melted cheddar cheese. It’s then topped with lettuce, red onion rings and tomato then finished with a combination of mayonnaise and honey mustard. The Deli – Click on image to enlarge.